GSB0014 specific to human kallikrein 1 (hK1) can greatly improve the effectiveness of several different kinds of immunoassays, such as ELISA, Western blot and Dot blot. GSB0014 is produced from the hybridoma which is fusion of Sp2/0-Ag14 mouse myeloma and B-lymphocytes obtained from mouse. After hundreds of selection cycles, our researchers successfully isolated an antibody against hK1 with high specificity and high sensitivity. This monoclonal antibody GSB0014is produced by mice immunizing with full length human kallikrein 1, derived from plasma or urine. 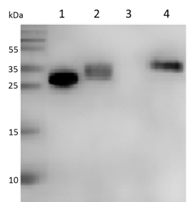 Western blot analysis of two kinds of recombinant proteins and endogenous protein by GSB0014. Lane 1 is E. coli expressed full length hK1; lane 2 is Pichia pastoris expressed full length hK1;l ane 3 is negative control and lane 4 is nature hK1 derived from urine.